The number of electronic transactions conducted by financial institutions around the world every day is growing astronomically. Today payments can account for a significant portion of a bank’s total cost. The ability to move money quickly and safely and to manage the associated data management flows are necessary components of banking. Banks must also gain critical insights from their data to stay steps ahead of Internet-based theft of bank and customer information. These thefts can dangerously undermine the efficiencies of more cost-effective virtual delivery channels. On the positive side, this data can provide key insights into the way their customers behave and the products and services that they are likely to buy. The FIS approach to enterprise payments puts the consumer account at the core, surrounded by rich functionality that provides access via multiple channels, extensive options for managing customer service, as well as a range of integrated fraud management tools. A complete payments solution for issuing and acquiring, clearing and settlement, FIS Enterprise Payments also contributes unique insight into the customer relationship. 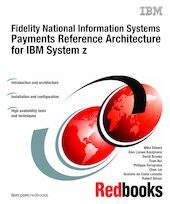 This IBM Redbooks publication describes the FIS Enterprise Payments offerings and how to implement them. The book is written for decision makers and financial solutions architects, and assumes a basic knowledge of payments systems.